From the Real Deal: Is EB-5 coming apart at the seams? Editor’s Note: The answer to the above questions is yes unless program reforms are initiated immediately. The most substantial criticisms of the EB-5 raised by the GAO and the DHS IG are (1) that there is no documentation of job creation and (2) little is done to aid rural or high unemployment areas. In that it is uncertain whether the Congress will act in the immediate future and the fact that the DHS proposals do not address the aforementioned concerns lead a former official of the White House Office of Management and Budget to petition DHS to make administrative changes immediately to restart the EB-5 program. The aforementioned petition is under serious review and could benefit from stakeholder and Congressional support particularly because it is very short and to the point. The “ask” should be to publish the aforementioned petition as an interim final rule effective September 1. President Barack Obama pushed out a flurry of regulations intended on being political time bombs for the Trump Administration. A good percentage of those destructive regulations were undone by the Congressional Review Act and others were stopped by Trump Administration officials if the process to implement the proposed regulations had not started yet. One problematic regulation has been kept alive by a Trump Administration staffer deals with a niche immigration issue. CRE’s petition seeks to unleash the job-creating power of the EB-5 program through a literal reading of the underlying statute. The law requires that EB-5 applicants taking advantage of the Target Employment Area (TEA) provisions of the program create jobs in rural and high unemployment areas. 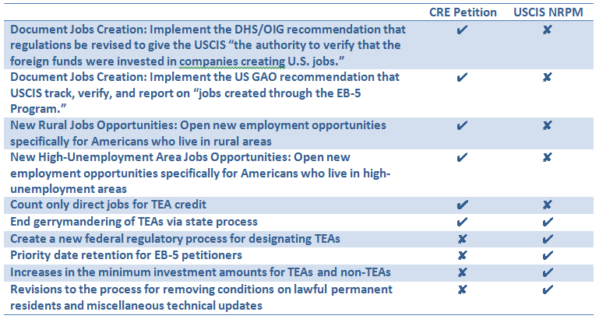 CRE proposes that DHS implement this provision by requiring that only direct jobs documented as being held by people living in rural and high unemployment areas count in assessing whether a project qualifies for TEA benefits. NEW YORK (Reuters) – Moinian Group on Friday broke ground on a 53-story tower in the burgeoning Hudson Yards district that is rapidly changing New York’s skyline in a more than $2 billion project the developer hopes to help finance through the EB-5 visa program. Moinian is seeking $250 million to $500 million in investment through the EB-5 program that provides immigrants with permanent U.S. residency in exchange for a minimum investment of generally $1 million, Moinian said at a ground-breaking ceremony. “A judge has ruled that, for now, defrauded EB-5 investors in a class action lawsuit against the state cannot take the deposition of a key whistleblower in the case. Lamoille County Superior Court Judge Thomas Carlson quashed the plaintiffs’ request for the deposition of Douglas Hulme, citing state rules prohibiting discovery until the defense has an opportunity to respond. The Unified Agenda Update shows that DHS’s path for complying with President Trump’s one-in, two-out Executive Order 13771 has become a tight needle to thread. The Update lists over a dozen DHS rules in Final Rule Stage. Within USCIS alone, there are four rules in the Final Rule stage and another three rules in the Proposed Rule Stage. The EB-5 Immigrant Investor Program Modernization rule which previously was in the proposed rule stage. As a matter of good and effective agency information resources management, agencies shall develop a process for reviewing the quality (including the objectivity, utility, and integrity) of information before it is disseminated. An agency spokesman replied that it would comply with all applicable statutes and regulations, including the Data Quality Act. The agency is to be complimented for its commitment to the quality of the information it disseminates. Editor’s Note: One of the loudest criticisms of the EB-5 program is that it harbors fraudulent actions. A widely reported action deals with the “the largest fraud case in the federal EB-5 immigrant investment program’s history.” The USCIS proposed regulations do not address fraud; for this reason CRE is examining a range of options for combatting fraud and will be reporting its findings on this website. If implemented the CRE option will allow the honest participants in the program to continue operations without a dark cloud over their operations.